Well, it’s been a month since my little Evie joined our family and I’ve had some great time off with her. We’re starting to get more into a routine around our house which means I’ve been able to try my hand at some new recipes worth sharing with you all. This is one of those recipes. It’s yummy. I love the quick and easy skillet method that is used to cook it and the fresh herbs really make this dish sing. You might think that shrimp mixed with cheese is a BAD idea . . . and, it is in most cases but this recipe is definitely an exception. Perhaps it’s because the feta cheese isn’t over-powering and instead offers a nice creamy touch to the finished dish. This dish is far from dull! The simple marinade for the shrimp helps to boost flavors. The tomatoes garlic, olive oil, and bell pepper really help enhance the dish. And, the Feta and dill added at the very end of the cooking time definitely made this dish taste Greek! This is a simple, flavorful, fresh, and unique dish that I’m guessing you’ll love like we did at our house. Enjoy! Toss shrimp, 1 teaspoon garlic, 1 teaspoon oil, lemon zest, 1/8 teaspoon salt and 1/8 teaspoon pepper in bowl until well combined; set aside. Combine 1 teaspoon oil, onion, red and green bell pepper, and 1/8 teaspoon salt in 12-inch skillet. Cover and cook over medium-low heat, stirring occasionally, until softened, 8 to 10 minutes. Add remaining garlic and red pepper flakes and cook until fragrant, about 1 minute. Add tomatoes and reserved juice and wine. Increase heat to medium, bring to simmer, and cook, uncovered, stirring occasionally, until sauce is slightly thickened (sauce should not be completely dry), 5 to 8 minutes. Stir in parsley and season with salt and pepper to taste. 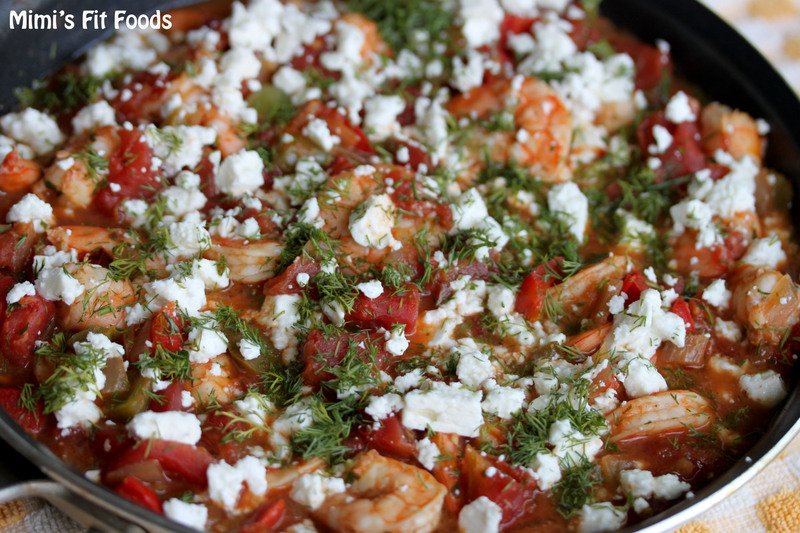 Reduce heat to medium-low and stir in shrimp. Cover and cook, stirring occasionally, until shrimp are opaque throughout, 6 to 9 minutes. Off heat, sprinkle evenly with feta and dill. Serve immediately.